Protected against UV degradation, extremely strong, manufactured out of bi-oriented polypropylene to increase its strength so it can support the weight of foliage even under strong wind conditions. 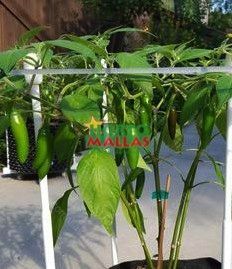 Ever since the 60s´ this polypropylene netting has been substituting metal or wood horizontal tutoring systems above flower beds. The number of layers of HORTOMALLASTM to be installed depends on the species of flower cultivated and the conditions of the greenhouse or open field. 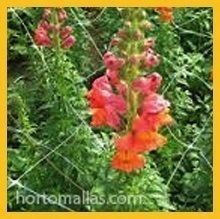 Install above the external heads of the flower bed. Stretch the netting tight. Intermediate post an both sides transversally at the required distance for each crop. 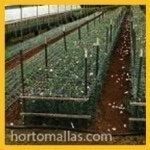 As a flower grower for the fresh cut flower market you know well that in order to receive a good price your cuts must be straight and healthy, and this is a characteristic that can only be achieved using a flower support net also known as HORTOMALLAS flower tutor netting. Flower support structures were (many years ago) composed out of bamboo, raffia twine and/or hot dipped zinc metal wire; these hand woven, labor intensive structures, were placed on top of the flower beds each growing cycle, but either the metal oxidized or the raffia was cut accidentally or was worn out by the sun or chemicals used on the crop, and in any case these systems had to be removed each cycle to allow earth work for the next crop, so labor to reset would be spent again. One must also consider the phytosanitary aspect of using raffia, as this type of support material, being nothing more than a twisted twine of a flat plastic thread, would allow bacteria, viruses, fungi and insects to take refuge inside its many folds and threaten the crops on a continuous basis. Also growers who used raffia used to pull the woven meshes up through the growing flowers, thus damaging the crop (and creating an entry pointy for pathogens) and stressing mechanically the plant reducing flower production. 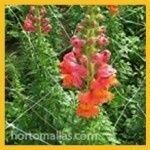 For these series of reasons HORTOMALLAS has become the standard in flower tutoring or flower support across the world, be it in open fields or under the most modern greenhouses. 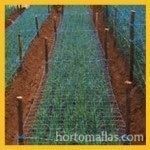 Needless to say HORTOMALLAS is the most used trellis support netting for horticulture as well. Flower cultivation with grow netting is very similar to the SCROG method (screen of green) used for growing other floral species whose objective is the development and exploitation of flower buds for edible and medicinal use. SCROG is also a synonym for SOG (sea of green). 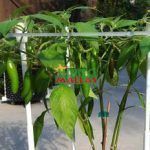 both systems (the SCROG and the SOG) increase the solar exposure of the plant by keeping the stem upright and confining inside a specific square of the netting mesh to avoid the plant from falling and leaning under the foilage and shoots of other plants nearby. Basically the SCROG netting maximizes the light source use, especially in controlled environments.